(a five star hotel on the shore of the Red Sea ). Materials: Acacia radiana tree, steel rib structure covered with expended net, ground stone & pigments, steel cable system , metal halide lighting projectors. Key Meanings : Natural-artificial existence , 'Enracinement - Deracinement', the Arava desert and Eilat 5 star hotels, earthquake monitor, transgression of the laws of nature. 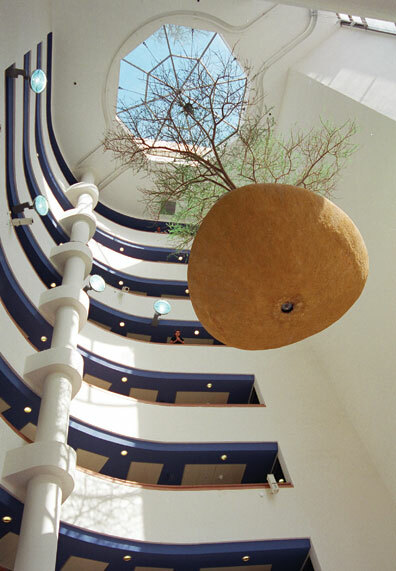 Artist Statement : The local desert Acacia tree - transplanted by a long and costly scientific process (successful for the first time), is finally transferred to the environment of the newly built 5 star hotel, to exist in mid air as a 6 ton pendulum . Can this artificial environment, with the help of its computerized climate, lighting and irrigation systems, support the life of the ancient natural inhabitant of the area?